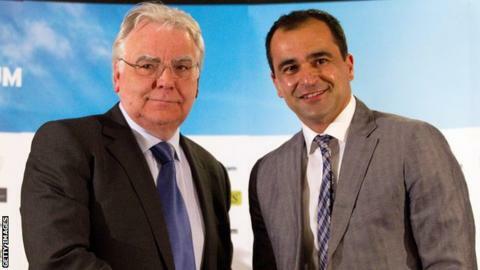 Everton boss Roberto Martinez says the club "is in the best possible hands" with owner Bill Kenwright, who is considering a potential £200m takeover. A US-led consortium is expected to perform due diligence on Everton's accounts over the next few weeks. Martinez would not comment on the potential takeover directly, but believes Toffees fans have reason to be optimistic about the future. "We all know what a fantastic chairman we have," he said. "He will always look for the best for Everton and clearly when it's something we have to share with our fans, the fans will be the first ones to know. "But whatever's going to happen in our future is going to be good because we're in a great position."